A lot of the focus in search-engine optimization concentrates on ranking for valuable keyword phrases. But are results for your pages that do rank in the search results visually optimized to drive click through to your site? Try these search-result optimization techniques to bring some bling to your search results this holiday season. 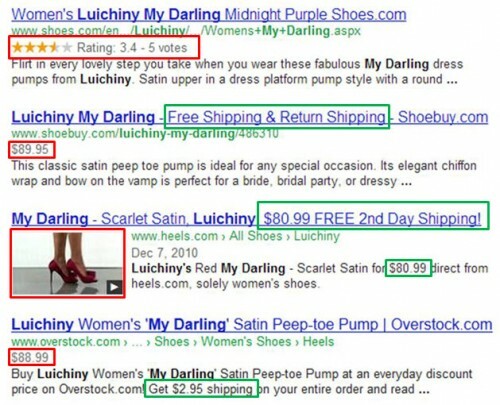 The sample search results from Google shown above are highlighted in red and green for a reason: The red boxes indicate items present in the search result thanks to what Google calls “rich snippets” and the green boxed items are simply updates to the title tag or meta description for that page. Taking advantage of these techniques can help your search result stand out from the crowd of 10 blue links to win the click, even if it isn’t ranked first in the search results. Let’s cover rich snippets first. Many sites contain reviews or video or pricing information, but not all of them have these visual cues included in search results. The search engines rely on structured data in the HTML code of the webpage to identify the content that belongs in these rich snippets. If the content is already on the page, using a structured markup format like Microdata, Microformats or RDFa will alert the search engines that the marked up content should be considered for inclusion in a rich snippet. Keep in mind that optimizing for rich snippets won’t improve your rankings, they will only help you stand out when you already rank….